LeCol Soap Bar is the brain child of former special education teacher Leslie Colvin. After retiring, she decided to turn her soap-making hobby into a business and did so in 2007 when she held her first Bubble Bash. 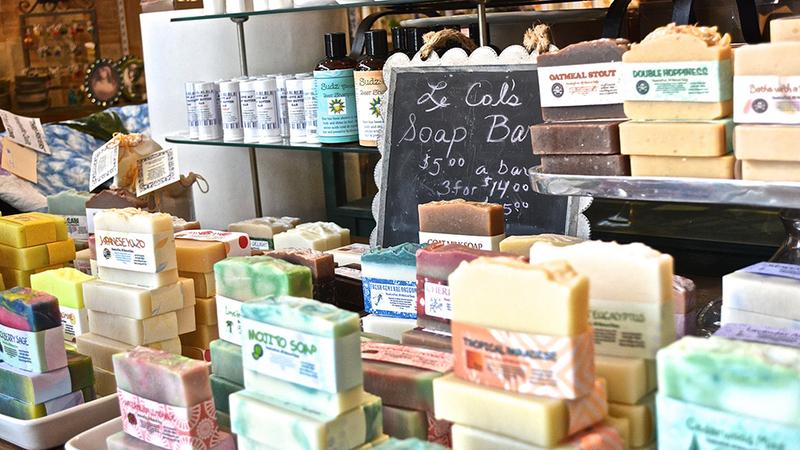 LeCol specializes in luxury, artisan, handcrafted soaps, body creams, balms, and scrubs. LeCol soaps contain nourishing shea butter and are made in small batches from scratch using the cold process method that involves slowly melting solid oils and butters and mixing them with room temperature alkaline solution. This ensures the natural glycerin is not removed and makes a naturally moisturizing soap. A blend of olive, coconut, palm, sunflower, shea butter, and castor oils, along with the finest essential oils or fragrance oils, makes LeCol soaps a bubbly, nourishing treat for all skin types. Enticing, innovative scents include fig rhapsody, kumquat carrot, and Japanese uzu. LeCol even makes a full line of soaps featuring Bend-based Boneyard Beer. Is this taking beer love too far? With options like Chocolate Expresso Stout and Suds for Studs, we think not. Every LeCol bar contains safe micas, ultramarines and color pigments to create beautifully swirled, colored, and textured soaps that are a work of art. LeCol products can be found at retailers throughout Bend as well as on the LeCol website.